A few years ago we were lucky to come across the Samuel Pierce Organ Pipe factory in Reading Ma. The business started in the 1860’s and lasted until the 1960’s. At the time we found it, the owner was using it for storage to buy and sell anything he could turn a profit on. There was about 20,000 sf between the four floors, basement and outbuildings. cases of glass lens blanks for telescopes and a lot more diverse items packing the place. They had so many maple shoe forms the workers were burning them in a wood stove during the winter. A sample deal by the owner would be to buy 100,000 plastic toy propellers sell off 50,000 right away and store the rest. After 30 years of doing that I think you get the picture. As good as digging through all of that was, we hit the jackpot on the stuffy and cramped 4th floor of the main building. 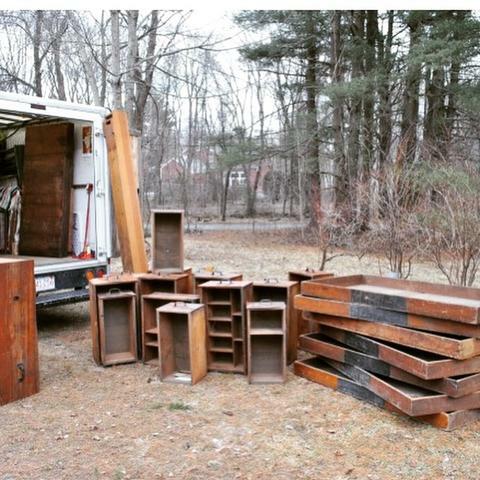 We found hundreds of the original 19th century organ pipe shipping crates. Stephanie negotiated a ” buy them all ” price with the owner who thought we were nuts to buy them. With some help from some local high school kids and a length of rope, we lowered all the crates off the 4th floor roof to our truck. 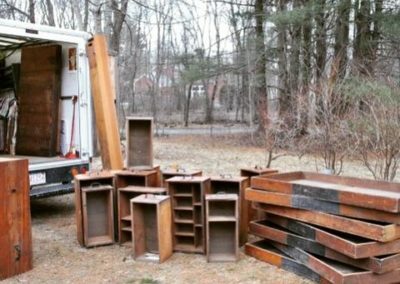 We took a load to Brimfield and sold a bunch then decided to save the rest for future projects. 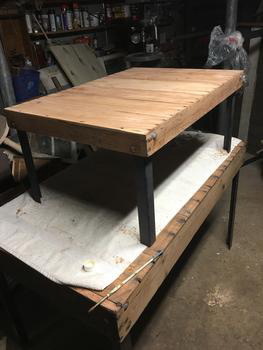 One of the crates in raw form on the bench. It would have been easy to sell the rest but items like these don’t come along very often. At the time we didn’t realize how nice these would clean up and become beautiful pieces of furniture. 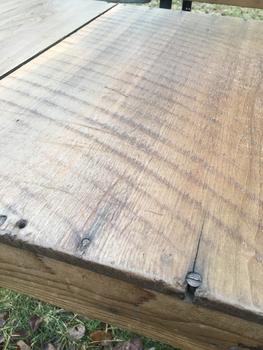 Sanding reveals saw blade marks from when the logs were first milled. 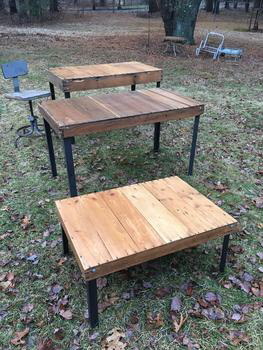 Two of the “crates” after sanding and the addition of metal legs (painted black). We kept one for ourselves that we made into a console table behind our sofa. 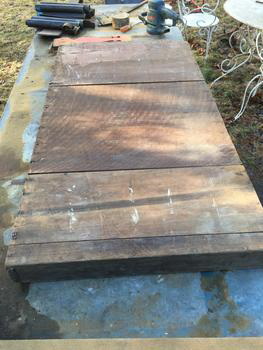 Two dining tables and one coffee table from 1800’s organ pipe crates. We like incorporating parts with history into our design projects. “The Factory” was our favorite place to pick until the building was sold to a developer for townhouses. 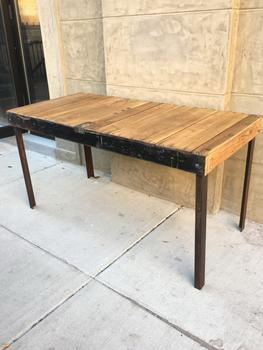 These tables and a few other reclaimed pieces are currently available at SoWa Vintage Market. Custom Orders welcome while organ crates last. Finished Dining Table made by John Warren waiting for SoWa Vintage Market to open, Sundays 10a – 5p.